Peaches. I’ve never really been too fond of them, until recently. 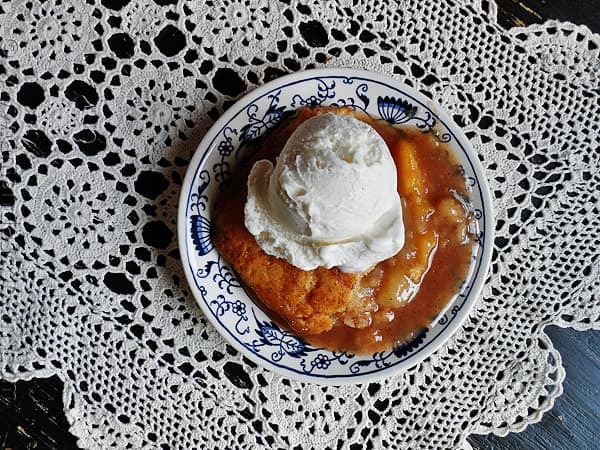 My husband is pretty happy that I’ve finally taken a liking to them as peach desserts have always been among his favorites. 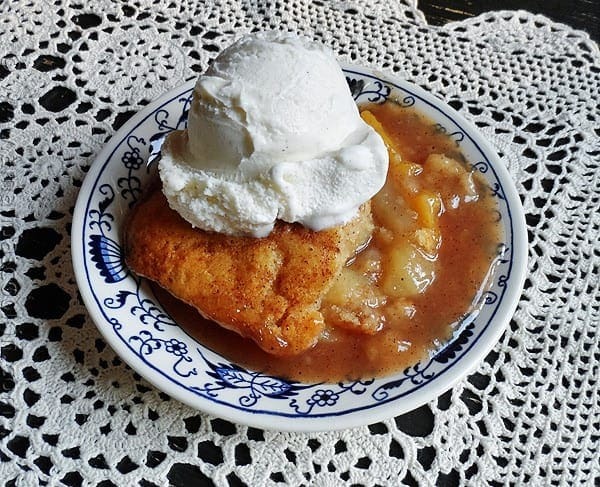 Crisps and cobblers have been hitting my radar pretty heavily lately (one of my favorites is this crockpot apple cobbler) , so this peach and pear crisp really fit the bill for me. 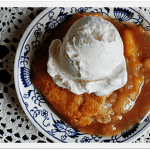 The original recipe is from The Southern Lady Cooks. In her version she uses all peaches, I changed mine to use both peaches and pears. I also upped the spices and have tried it both with brown sugar and white sugar. I was a little confused by her instructions on when to add the salt since hers said to add it in two different steps, so I just added it in the first step and it worked fine :) I even made a version with pineapple and peaches, which was quite good, but I think it needed to be baked longer. This is very easy to make [full printable instructions below]. You’ll drain the fruit and reserve the juice. 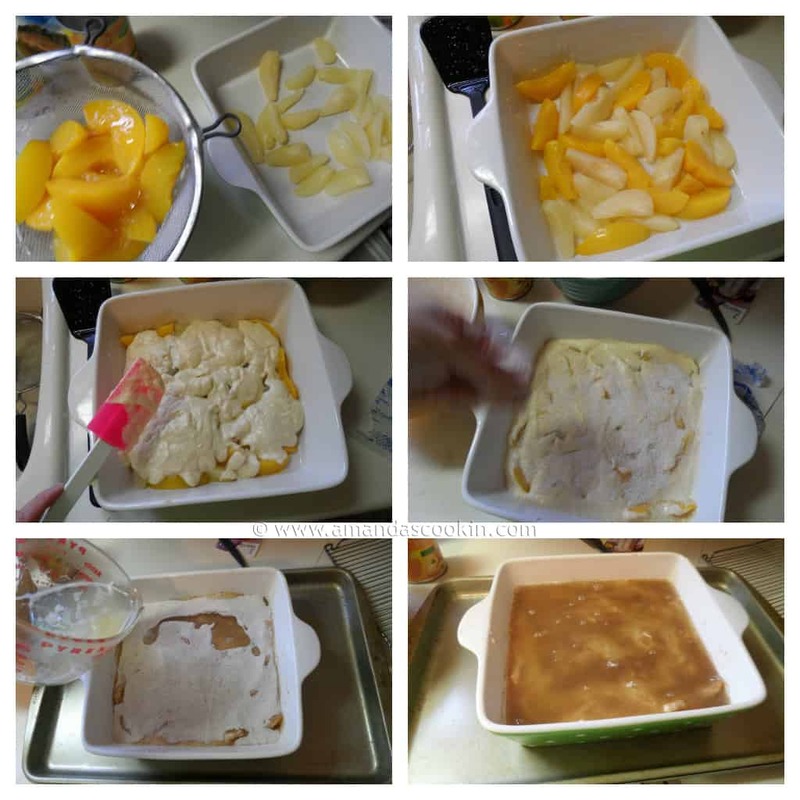 Layer the fruit, make the batter then top the fruit with it. Whisk the sugar with the spices and cover the batter. Boil the juices and cover the top with it. Bake it and enjoy! 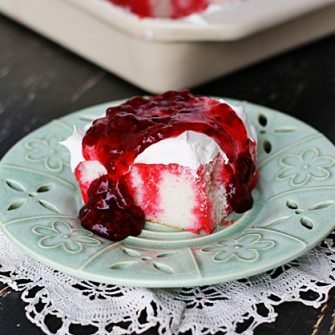 At any rate, this is an amazingly delicious dessert that’s perfect for the holidays, or really, anytime you have a sweet tooth. A generous scoop of vanilla ice cream is definitely the “icing on the cake” so to speak. This will be gracing my Thanksgiving table this year! Drain peaches and pears reserving liquid. Spread fruit in the bottom of a 9 x 9 inch sprayed baking dish. Cream together butter and 1/4 cup of the sugar in your mixer until light and fluffy. Turn mixer down to low and add the flour, baking powder, salt and evaporated milk. Turn mixer up to medium and mix until well combined. Spread the batter over the fruit with a spoon. Combine the peach and pear juice in a glass measuring cup. Bring to a boil in the microwave and then pour over the sugar mixture in the baking pan. Bake in preheated 350 degree oven 55 to 60 minutes. Serve with topping of your choice or ice cream. Variation: Fresh Fruit - If you prefer to use fresh fruit, use about 4 cups of fresh peaches and pairs and substitute 1 cup of water for the canned juices. Peaches are one of my all time favorite fruits! Looks really good! Mmmm…I’ve never combined peaches and pears, sounds delicious!! i love a crisp anything for breakfast! looks delish!